South Carolinian by birth, Calhoun was a congressman, secretary of war, vice president from 1825 to 1832, a senator, and secretary of state. He is best known for his defense of the doctrine of states’ rights, arguing that the U.S. Constitution was a compact among the states, which were sovereign, so that any state could nullify an act of Congress by pronouncing it unconstitutional. “Nullification” effectively protected slavery by disallowing—in the absence of a Constitutional amendment (which required ratification by two-thirds of the states to pass)—federal laws intended to curb slavery. 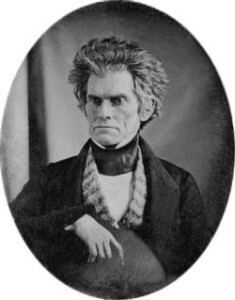 Calhoun’s nullification doctrine also implied the right of states to secede from the Union and thereby provided a theoretical basis for the formation of the Confederacy and the start of the Civil War.